The Women In Ministry of the AME Churches of Bermuda will be hosting a Preaching Women’s Empowerment Weekend from Thursday [Sept 13] to Sunday [Sept 16]. “The weekend will include a variety of activities designed to strengthen women ministers from all denominations, increase their unity as co-labourers in the gospel, celebrate the contribution of some of our female trailblazers and encourage the next generation of female ministers as they discern their call and begin their ministerial journey. “The weekend will begin on Thursday evening at 7:30 pm with a panel discussion: “The Daughters Were Right”, at St. Andrews Presbyterian Church on Church Street Hamilton led by a panel of female participants from various denominations who will share about their journey as ministers and provide perspectives on a variety of topics. “On Friday during the day we will engage in Youth Outreach and will journey to various Middle and High Schools to share about Ministry as Vocation to students and witness regarding living a life dedicated to ministry. The day will conclude with Friday Night Fire, an empowering worship experience at Mount Zion AME Church where the Rev. Ruth VanLowe Smith will be the preacher and there will be guest ministers in music and dance. “The highlight of the weekend will be an Ecumenical Prayer Breakfast and inaugural WORD Award Celebration at Discovery Hall at the CedarBridge Academy. 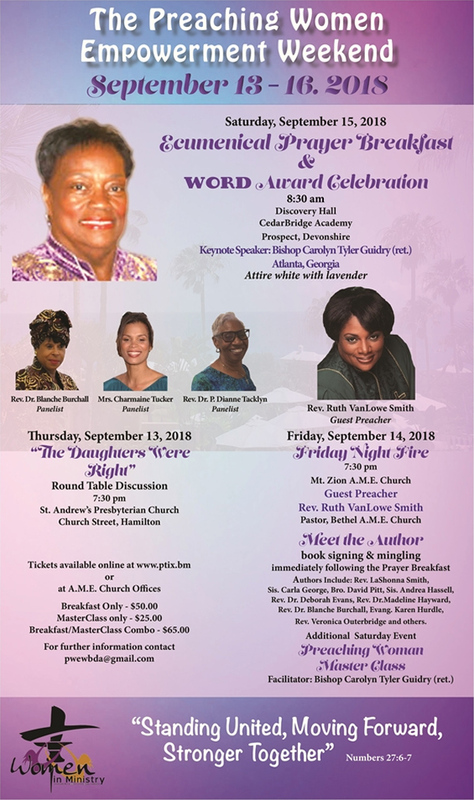 The WORD [Warriors of Rare Distinction] Award Celebration will highlight female trailblazers in ministry and the awards will be named after five outstanding female leaders in the AME Church who made a significant contribution during their lifetime to the advancement of the gospel both here in Bermuda and overseas. “Honorees are Retired Presiding Elder Rev. Betty Furbert-Woolridge, Rev. Yvonne Thompson, Rev. Blanche Burchall, Evangelist Joan Simmons and Sis. Jennifer Bascome. “The guest speaker for the breakfast will be Bishop Carolyn Tyler Guidry, retired Bishop in the AME Church. The breakfast will be followed by a Preaching Woman MasterClass for both seasoned ministers and those discerning their call led by Bishop Tyler-Guidry. Cost for the breakfast is $50 per person and the Ministry MasterClass is $25. Tickets are available online at ptix.bm or at AME Church Offices. “The breakfast will also include an opportunity to meet the author immediately following, where Christian authors will be available to sign books, share one-on-one with breakfast attendees and sell their publications. “On Sunday we will celebrate Women in Ministry Sunday in the AME Churches throughout the island and we are encouraging our congregations to highlight the contributions of the females within their congregation who have answered the call to ministry. “We look forward to a transforming weekend that will strengthen and unite females who have dedicated their lives to the advancement of the gospel of Christ. We ask for your prayers for God’s blessing on this endeavour and invite the support of the entire community as we come together to magnify the Lord. Behind any great man is an even greater woman.